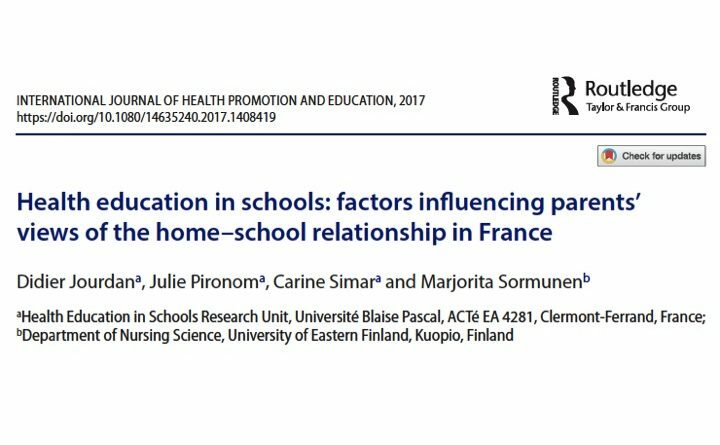 L’article « Health education in schools: factors influencing parents’ views of the home–school relationship in France » vient d’être publié dans la revue « International Journal of Health Promotion and Education ». Il s’agit du fruit d’un travail de recherche partenarial associant le laboratoire ACTé (Julie Pironom, Carine Simar, Didier Jourdan) et l’équipe de recherche en éducation à la santé de l’University of Eastern Finland (Marjorita Sormunen). Ensuring that schools, families and communities work in partnership to reduce the gradient in health, well-being, and resilience of children and young people is considered a priority among public health objectives. This study aimed to explore the factors having an influence on the home–school relationship in general and in the field of health. Emphasis was put on socio-economic factors. A questionnaire was administered to parents of fourth- and fifth-graders attending 37 primary schools in France. Demographic and social characteristics, and views on the home–school relationship and on health education were analysed. The majority of parents (67%) were satisfied with their relationships with their child’s school, but 22% of parents indicated the reverse. Lower socio-economic status (SES) parents were more satisfied with the home–school relationship than higher SES parents were. Parents acknowledged that health education belongs at school, but they did not see it as important a school subject as mathematics or language. They were also critical about school staff members’ health education competence (5.07 ± 2.38 on 10). Parents with lower SES had a closer relationship with their child’s school than parents with higher SES did. This suggests that schools can play a key role in the reduction of health inequities. Nevertheless, enhancing a school’s potential to become a healthy setting appears to be challenging since parents considered both the status of health education and school staffs’ competence in teaching health issues low.